The TS-1 tile saw features a 1.5HP motor and is guided by dual linear bearing on induction hardened chrome bars. 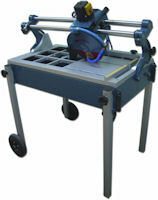 The cast aluminum, machined working table provides for accurate cutting with a range of 40° to 45°. The TS-1 is now available with wheels for easy movement around the shop or worksite.